Certain chemicals that enhance properties of toys are found to expose children to health risks. Are there solutions available to make toys safer, asks Angelica Buan in this article. Appraised to value US$135 billion by 2020, the global toy industry is undergoing major shifts as technology has pervaded this sector, and thus broadened the selection of toys from traditional to electronic. Nevertheless, what remains constant is the vigilance of consumers on the safety of toys. The US Consumer Product Safety Commission (CPSC) has recorded toy recalls due to product hazards ranging from injury, fire and allergic reactions to materials containing lead and lead-based paint, and even because of manufacturers’ non-compliance to safety regulations. 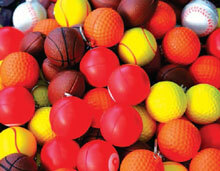 Materials used in toys are of importance in determining the safety. Over the years, safety compliances have been addressed, thus lowering hazardous incidences. In 2014, toy recalls remained low, with only 30 toy products being recalled, one of which involved a lead violation, as compared to 172 toy recalls in 2008, 19 of which were due to excessive lead content, according to CPSC. Aside from lead, other component chemicals, such as Bisphenol A (BPA), are the reasons as to why plastic toys and products get the flak among consumers. Moreover, sharing the problem are other so-called endocrine disruptors such as phthalates, dioxins, fire retardants, perfluorinated chemicals, and others such additives, which have found their way into common products. An article published in 2010 by the National Centre for Biotechnology cited that in the second half of the 1990s, a number of food contact articles and baby toys had been reported to contain these chemicals. Country specific and regulatory bodies like the US Food and Drug Authority (FDA) have enforced limitations on the use of BPA and other chemicals that are proven or suggested to pose health risks. Meanwhile in bid to strengthen safety policy for toys, the F963-16: Standard Consumer Safety Specification for Toy Safety has been crafted, an updated version of the standards development organisation ASTM International’s safety standard for toys. The revisions are made against potential emerging safety issues, new product safety features, and novel ways that toys are being used that may pose risks to children, according to toy safety sub-committee officials. Included in the 2016 update are material-related issues, such as new requirements for materials and toys that could expand if accidentally swallowed; clarifications to requirements related to heavy elements in the substrate materials of toys and others. A hazard suspect in toys, phthalates are chemical plasticisers that are often used in the production of various types of plastics for reasons such as making plastics softer and more pliable. According to CPSC, there are currently six types of phthalates that are restricted for use in children's toys and certain child care articles in the amounts prescribed by product safety standards. As of February 2009, three phthalates – DEHP (Bis(2-ethylhexyl) phthalate), Dibutyl phthalate (DBP), and BBP (benzyl butyl phthalate) – at concentrations greater than 0.1% in toys and child care articles have been permanently banned in the US. Meanwhile, DINP (1,2-Cyclohexane dicarboxylic acid diisononyl ester), DIDP (Diisodecyl phthalate), and DnOP (di-n-octyl phthalate) have been temporarily restricted in toys that can be placed in a child’s mouth and child care articles, and have been referred for further study. The American Chemistry Council (ACC) opposed these restrictions, saying the decision was “not based on science”. ACC also advised that in 2012, the National Industrial Chemicals Notification and Assessment Scheme (NICNAS) of the Australian Government Department of Health and Ageing joined regulatory bodies in the US and Europe that have found that current uses of DINP in consumer products are not expected to pose a risk to human health. 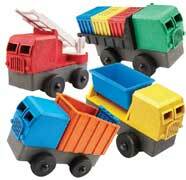 Nonetheless, some toy manufacturers are opting for phthalate-free production. But again, alternative additives to phthalates have also earned their fair share of scepticism among health advocates. A report released by the French Agency for Food, Environmental and Occupational Health & Safety (ANSES) says that four of the phthalate substitute chemicals, DINCH, DEHTP (Di-2- ethylhexyl terephthalate), ATBC (Acetyl Tributyl Citrate), and TXIB (2,2,4-trimethyl-1,3-pentanediol diisobutyrate) found in plastic toys and materials, which it assessed for health risks with oral exposure, do not pose any risk to children's health. Nevertheless, ANSES recommends evaluation on all new substances used for producing plastics for toys for children (under the age of three). Further risk assessments are recommended for substances found in toys that can be mouthed, and in particular when they are new substances, even before marketing, based on migration testing to provide an estimation of child exposure by the oral route. ANSES also plans to conduct an assessment of the combined health risks of exposure to certain phthalates in its work programme on endocrine disrupting chemicals (EDCs), which will take into account several exposure routes. In addition, given that substances have been detected whose use is restricted or banned in numerous toys marketed in Europe, the agency emphasises the relevance of inspections carried out in the toy sector in order to avoid the marketing of those toys in France, which are not compliant with the regulations, and it recommends maintaining at the very least the same level of vigilance. The claims against EDCs have resulted in a new breed of plastics that are biodegradable, biobased materials purported to be safer alternatives. Danish toy maker Lego, in its surprising move to forego oil-based plastics, has invested US$150 million for a new sustainable materials centre in Denmark as it begins to steer towards acrylonitrile butadiene styrene (ABS)-free plastic toys, targeted by 2030. While ABS has not been linked to any health issues, and has been the ideal sturdy material for the 60 billion bricks that Lego produces a year, the company is intent to shift to biobased material. Similarly, other toy makers are ensuring that their products comply with local and international safety standards. US-based Kids Preferred is using BPA and phthalatesfree plastics for its products. It recently launched its new collection of biobased toys known as Bioserie. The collection uses a special blend of modified polylactic acid (PLA); and no oil-associated substances like BPA, PVC, phthalates, styrenes and heavy metals. The economic cost of exposure toEDCs is given a figure in a recent study by the New York-based academic medical centre, NYU Langone. In the report titled The plastic plague: Hormone-disrupting chemicals in everyday things, a variety of products from plastic water bottles and cheap toys to cosmetics, are made with these chemicals that could cause neurological damage and behavioural problems. Disorders caused by exposure to these chemicals can incur US$340 billion a year in healthrelated costs. NYU Langone researchers led by Dr Leonardo Trasande claim that exposure to EDCs chips off more than 2.3% of US’s GDP; and nearly 2.3% that in Europe. The bans on these chemicals are not as widespread as many critics have hoped for, with organisations such as the ACC enquiring the validity of these studies and seeking further evidence to tie up these chemicals to health risks. Amid the boon points on plastic, it remains a ubiquitous material for toy making. The British Plastics Federation (BPF) attributes reasons for the popularity of plastics in toy making to cost, ease of moulding and possibility of producing complex forms. Early this year, Italian biotech company Bio-on collaborated with Italeri, an Italian manufacturer of plastic scale-model kits of airplanes, military vehicles, helicopters, ships, trucks, and cars. With the collaboration, Italeri is manufacturing scale models with Bio-on’s special-grade bioplastic, Minerv PHA Supertoys, launched in late 2015. 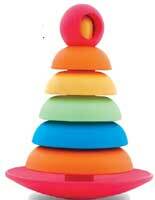 The Bio-on biopolymer is 100% biodegradable and compliant to Europe’s Toy Safety Directive. It has been tested in dozens of applications, from automotive to design to biomedical. According to the partners, the Minerv PHA project demonstrates that specific, eco-sustainable and completely biodegradable formulations can be created for making toys that are safe for children and the environment, without losing out on the end product’s functionality and aesthetic. The project is expected to produce two bioplastics by the end of 2017 – rigid Minerv PHA type R, and the ductile and flexible Minerv PHA type F.
Likewise, offering non-oil materials to toy makers is US-headquartered bioplastics and biocomposites producer Green Dot. The company’s rubber-like compostable bioplastic, which it introduced to the toy industry in 2012, is free from phthalates, BPA, lead and cadmium. The Terratek range of bioplastic is said to produce durable and pliable toys and at the end of life, toys may also be disposed in a home composting environment where it will gently biodegrade in a matter of months to return to plant nourishing soil. 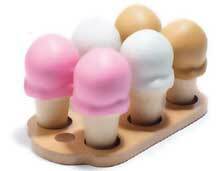 Toy makers that are using Green Dot’s bioplastic include BeginAgain Toys for its Scented Scoops ice cream play set; and Luke’s Toy Factory, for its toy trucks.